A nice romantic meal needs some good side dishes, but you also want to keep in mind that you want the meal to be elegant but easy too. It’s not much fun if you have to spend hours in the kitchen cooking and then by the time you eat you are too exhausted to enjoy it. That’s why these sides were great to make. They go perfectly with the beef we had for the meal (recipe to come tomorrow) and both were made very easily. 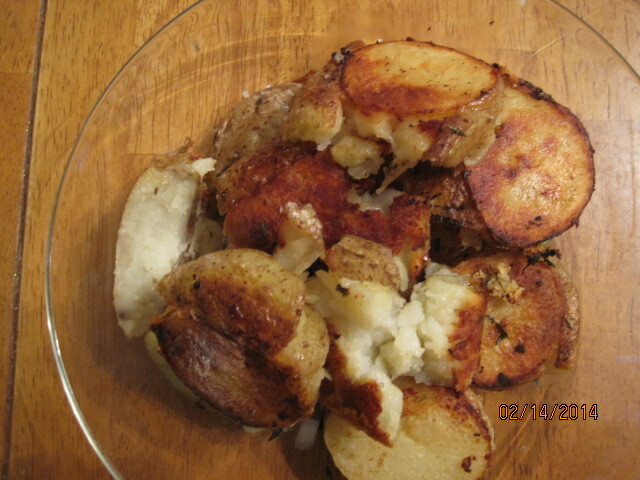 The first is for garlic-thyme smashed potatoes that you can do simply on the stove top with just a few ingredients. In a large nonstick skillet set over medium-high heat, melt the butter with the olive oil. Add the potatoes and water and season the potatoes generously with the kosher salt and ground black pepper. Cover the skillet and cook until the potatoes are tender, about 20 minutes. Remove the skillet from the heat and smash the potatoes lightly with a spatula or potato masher. Return the skillet to medium-high heat and cook, uncovered, until the potatoes are beginning to brown underneath, about 2 to 3 minutes. Add the garlic and thyme and cook, stirring constantly, until the herbs are fragrant, about 1 minute. Adjust the seasoning with salt and pepper and serve. The potatoes get a great crust on them that make them nice and crunchy and the taste of the garlic and thyme goes perfectly with the rest of the meal. You can make these any time and I think they would go perfectly with any beef, pork or poultry meal. The next dish was a very easy sautéed spinach with garlic. We make spinach pretty often and this is probably my favorite way to have it. You can cook this in under 5 minutes and have it on the table and it is a great, fresh alternative for a vegetable that night. In a large nonstick skillet over medium heat, warm the olive oil until it is shimmering. Add the sliced garlic and cook, stirring constantly, until the garlic is fragrant, about 30 seconds. 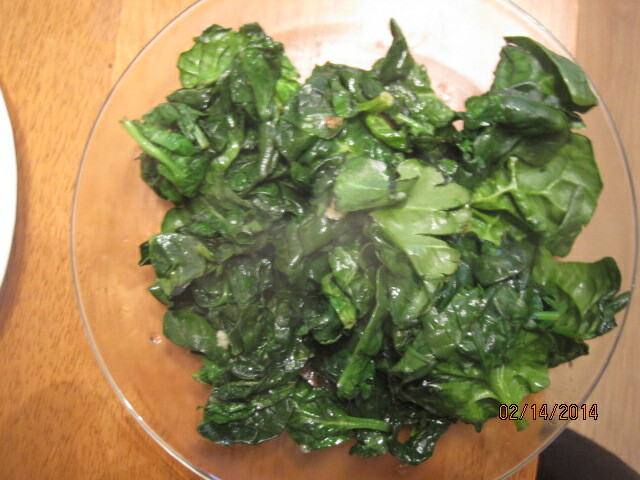 Add the spinach in batches and cook until it is wilted, about 2 to 3 minutes. Season with salt to taste and serve. A couple of things about the spinach. Make sure you wash it in a salad spinner or rinse it off before you cook it. Even the stuff that comes in a bag and says it is washed can still be gritty, so it never hurts to give it an extra rinse and dry it off. You also want to make sure you stir the garlic well when you put it in so it does not brown, burn and get bitter. It might not seem like all of the spinach will fit in one pan but spinach cooks down very quickly so you should have no problem. Spinach and garlic go together really well so this is the perfect side dish any night of the week, and is a classic side dish with steak or beef. That’s all I have for today. Check back next time for another recipe. I’ll be highlighting the main point of our Valentine’s Day dinner, the rib-eye steak and the broiled lobster tails. Until next time, enjoy the rest of your day and enjoy your meal!